A new approach to delivering visitor information is being rolled out in Ōtaki. Two large composite metal destination maps have been installed recently on State Highway 1 outside the old court house and toward the southern entrance near the Sunday markets. 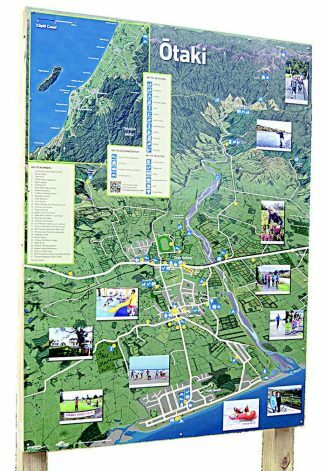 Posters of the map have also been placed at prominent visitor stops around Ōtaki including petrol stations, cafes and shops. 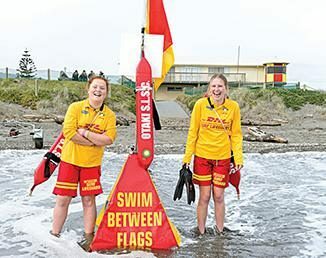 The roll-out includes the large signs with photos and listings of attractions and facilities, visitor information manuals at fuel stations and cafes, and Visiting Ōtaki web pages on the Kāpiti Coast District Council website. In the future there will be an extensive digital presence, with a similar approach being planned district-wide as part of a visitor attraction strategy being developed by council. A key aim is to ensure people passing through the town who stop at the outlet shops are aware there is so much more to see and do in Ōtaki. Activities include the beach, fishing, cycling, walking, tramping, fruit and vegetable picking, golf and visiting historic sites. Even many locals were unaware of some of the ‘must dos’ included in a recent visitor information edition of Ōtaki Street Scene. Ōtaki ward councillor Penny Gaylor says the stylised signs depict the coast, township, plateau and hinterland in a fresh, distinctive way. 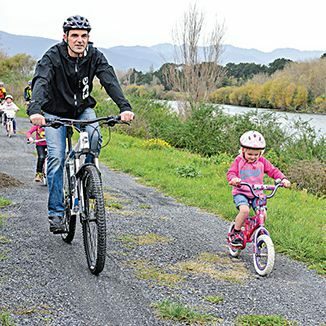 Other ideas being explored include training staff at key Ōtaki businesses so they are very familiar with the visitor manual and can be ambassadors for the area, and developing suggested itineraries, including a cycle tour.